Adam Grant is a professor at the Wharton School of Business whose research focuses on “motivation, prosocial giving and helping behaviors, initiative and proactivity.” His work and writing, including his book Give and Take: A Revolutionary Approach to Success, seem to have something to offer those interested in and engaged in developing networks for social change, as much of it points to data showing that organizations of all kinds benefit from fostering cultures of giving. Grant claims that people exhibit behavior in the workplace that puts them into one of three categories: givers, takers, and matchers. 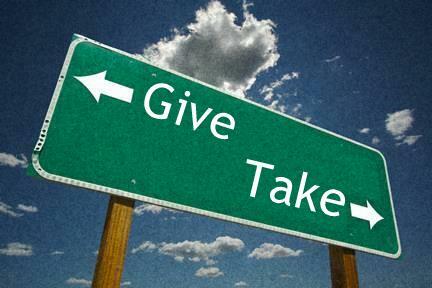 Givers tend to give more than they expect to receive, takers take more than they give, and matchers end up with more of a 1:1 ratio around giving and receiving. Grant’s own and others’ research show that higher rates of giving are predictive of higher productivity, efficiency, and customer satisfaction, along with lower costs and turnover rates. “When employees act like givers,” Grant writes, “they facilitate efficient problem solving and coordination and build cohesive, supportive cultures that appeal to customers, suppliers, and top talent alike.” And there is a catch . . .
Balance feeling empathy with thinking about others’ perspectives. Keep the purpose and vision of the network front and center, the higher cause if you will. Support an environment where diverse stakeholders are welcome and can engage with issues of power, equity, and inclusion to create equitable opportunity. Help people to develop trusting relationships through storytelling and other practices. Invite a personal practice of paying attention to the needs of others, thinking about what we each have to offer others (including other connections in our networks), and making offers/closing triangles. June Holley’s Network Weaver Handbook has some helpful guidelines and exercises for supporting this behavior. Encourage people to be grateful recipients of the wisdom, knowledge, talents, connections, and experiences of others. Curious to hear other ideas, as well as reactions to Grant’s work and its applicability to social change. Love Adam Grant’s work and the way ancient wisdom needs to be validated by research in our day! Also appreciating your link to networks – that really is the power of a vibrant network, relentless generosity! Agree with both of you. It’s hard to think of powerful work for social change that didn’t involve a high degree of generosity and love on the part of organizers and others active in the work.